The beginning of the school year can be overwhelming while trying to establish procedures, routines, and introduce learning centers. One of the easiest way to make sure this time is as stress free as possible is to use learning center activities that can include all learning levels. 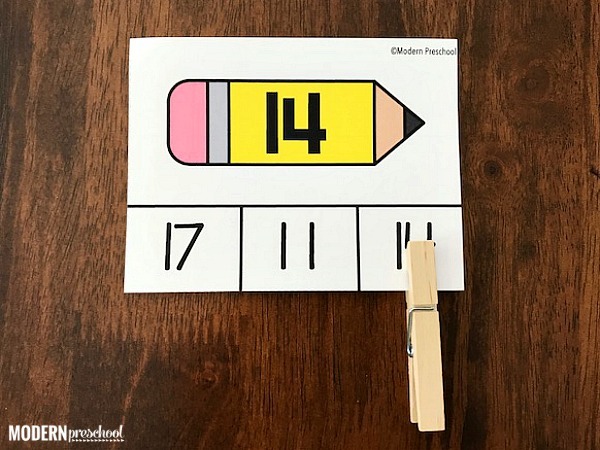 This is when printable activities like our school pencil number matching clip cards work so well. Plus practicing skills using fine motor muscles is always a bonus! 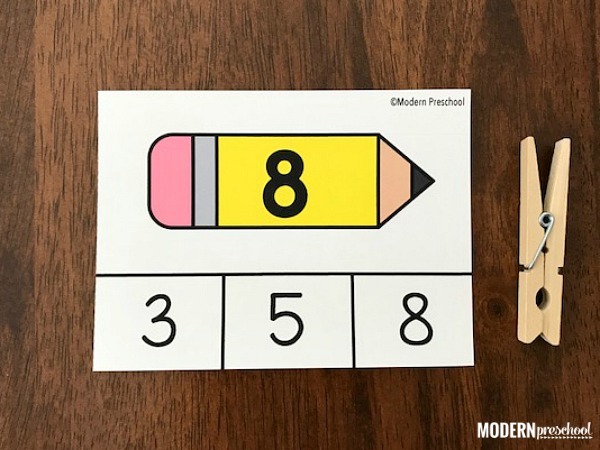 This free printable set of pencil number match clip cards includes the numbers 1-20. Each card has a pencil with a number on it and three numbers to choose from at the bottom. Print the set from the pink button below. Cut the cards apart on the gray dotted lines. Laminate the set for added durability. You know there’s always that kid who insists on bending all of your printables, so laminating is needed! After the pencil number match clip cards are ready, put them in a small basket or tray and add clothespins. My preschoolers insist on having one clothespin for each card, so I always am sure to stock up at the dollar store over the summer. The object of the pencil match number cards is to identify the number on the pencil, and then find the same number at the bottom of the card. 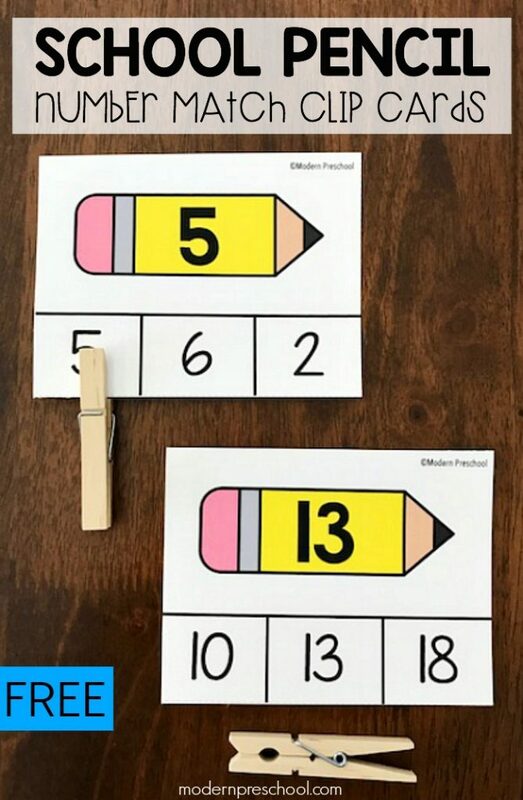 Using visual discrimination skills, kids have to look through the 3 numbers and choose the matching one. 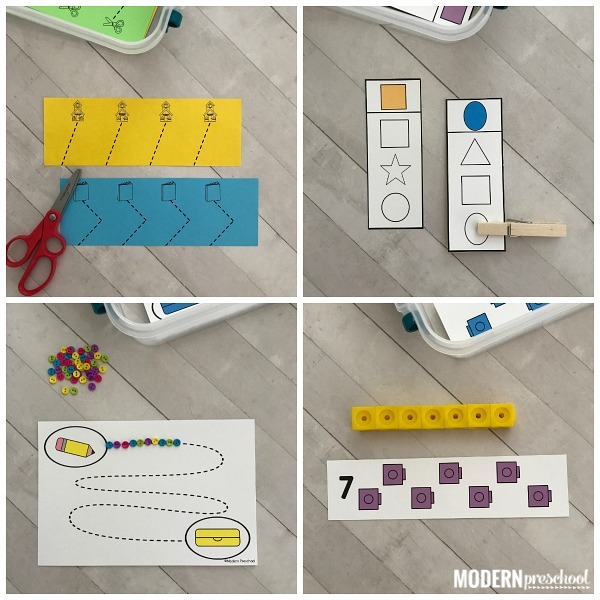 The nice thing about this printable math center is that number identification does not have to be mastered in order to be successful. Simple matching is all that is needed. 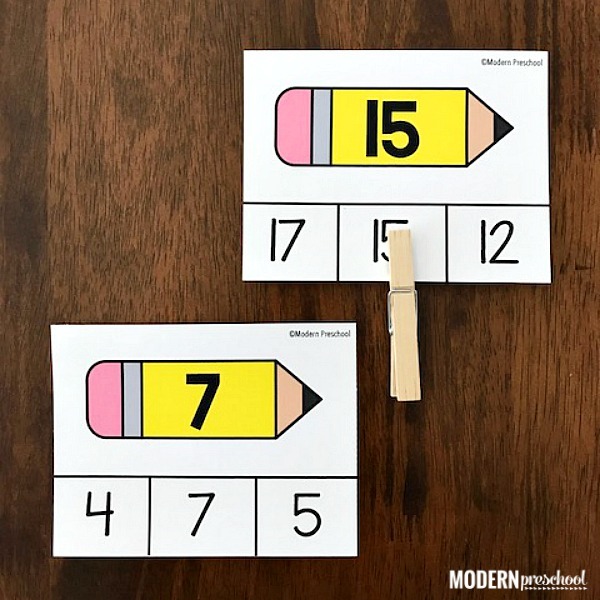 I introduce activities like the pencil number match clip cards in circle time. We go over what is on the cards and how they work. I start by having my preschoolers help me find the correct answer on the card. We identify the number and then each number choice on the bottom. Then I make sure to take the time to show them how to pinch open the clothespin. At the beginning of the year, I also offer alternatives to the clothespins if needed. I am also big about showing non-examples. Preschoolers love to tell me that I am wrong, or what not to do. When they are correcting me, I know they understand the activity! My goal is to have this be an independent activity during center time, so success without frustration is our goal. As you are prepping for going back to school, you do not want to forget to prep an entire set of back to school themed fine motor busy bins. These activities were created to be independent activities for older preschool kiddos, and work perfectly for small group activities with the younger guys. I already have my set prepped and ready to go! So many back to school activities to choose from! Grab your set of pencil number match clip cards now. I love everything I have bought and/or downloaded from Modern Preschool so far! I have a question though…what does endless mean in “endless bundle”? Thank you for such cute and fun learning tools!